Employers should take note that a significant number of legal changes on the federal, state and local level have or will have a substantial impact on workplace policies and employee handbooks. 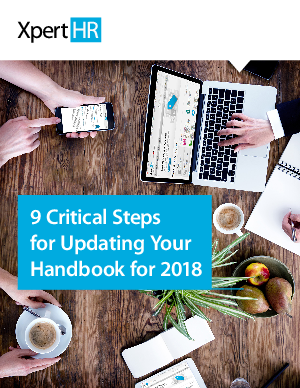 It is critical for an employer to review, amend and properly update its handbook for 2018 so that it reflects the latest legal requirements. An employer also needs to understand what the legal update is and how it affects the workplace, as well as develop and implement policies, practices and procedures to remain compliant. Further, an employer may need to update its employee handbook based on internal changes (e.g., benefits, performance management). This guide includes relevant XpertHR resources, including Employee Handbook policy statements, to assist an employer in updating its own handbook.